There are many possible causes of swollen feet and ankles. Someone who stands for many hours, possibly because of a job like a hair stylist, or a cashier at a grocery store, will have foot swelling along with puffy ankles. Like pregnant women, the elderly may be more prone to lower extremity swelling. Another name for this type of abnormal swelling is called peripheral edema. Just like standing for long hours, sitting for a large stretch of time, like when traveling, or sitting at a computer at work all day. Other causes swollen feet and ankles include inadequate circulation, menstrual periods, obesity, hormone imbalance, high blood pressure, kidney failure, hot and humid temperatures, and certain medications. Venous insufficiency and varicose veins are other causes of lower extremity swelling, particularly feet and ankles. With various remedies, whether natural from home or prescriptive from a physician, swollen feet and ankles can often subside. For instance, many may suggest ice baths for sore feet from running. Exercising has been known to increase foot circulation. One of the more popular, widely known remedies for swelling of the ankles and feet is to keep feet elevated above the heart when lying down. This stimulates the blood to effectively flow through the lower extremities and the rest of the body without the blood just pooling down at the ankles and feet. Limiting salt intake will prevent swelling of extremities. Losing weight is another factor to play a role in ankle and feet swelling. 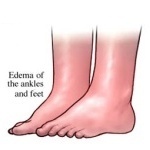 There are also medications to help with this type of edema. These include ibuprofen, naproxen, or furosemide which is a diuretic known as Lasix. If other symptoms besides feet and ankle are being experienced, such as shortness of breath, low urine output, fever, etc., a healthcare professional should be contacted to rule out more serious issues.